Groups will identify complete subjects, complete predicates, simple subjects and simple predicates. Students will then mix them in a grammatically correct manner to develop various complete sentences. Toobeez. Separate the piles in the room. Using sentence strips, write down different complete subjects and complete predicates (samples are provided on page 75 of the Appendix). Discuss the importance of writing complete sentences. Ask students, “What happens if a sentence is written incompletely as a fragment instead of as a complete sentence?” Students should state something to the effect that writing becomes unclear and is difficult to comprehend. *The complete subject is the “who” or “what” (noun) doing the action plus all the modifiers (adjectives, adverbs, articles, etc.). *The simple subject is just the “who” or “what” doing the action. *The complete predicate is the action (verb) plus all the modifiers (adverbs, prepositional phrases, etc.). *The simple predicate is just the action. Sample: The sneaky gray mouse quickly gobbled the cheese. Challenge: Groups will identify complete subjects, complete predicates, simple subjects and simple predicates. Students will then mix them in a grammatically correct manner to develop various complete sentences. 4. Distribute sentence strips with sentence fragments written on them. Students should not read what is on the strip until told to do so. 5. Separate the students into two groups by subjects and predicates near each of the piles of Toobeez. Once assembled in their areas, be sure everyone is in the appropriate group. Make adjustments as needed. 6. Take a few minutes to have each group share some examples of their complete subjects and complete predicates. Then, review the terms simple subject and simple predicate with the groups. 7. Using scissors with caution, each student should cut out the simple subject or simple predicate from their sentence strip. 8. Now have students tape simple subjects to a small Toobeez, subject modifiers to large Toobeez, simple predicate to a small Toobeez, and predicate modifiers to large Toobeez. 9. Group students into two or three medium-sized groups to see how many different sentences they can make with their Toobeez by linking tubes together with spheres. 10. Have students record their variations as they come up with complete sentences. 11. Switch up the groups after five minutes and repeat this exercise as often as time permits. Remove the simple subject or predicates from the sentence strips to make new sentences. What is the simple predicate? The simple subject? The complete predicate? The complete subject? How do you feel everyone worked to build complete sentences? What challenges arose during this activity? How do you feel using the Toobeez helped you to better understand the concept of complete sentences? 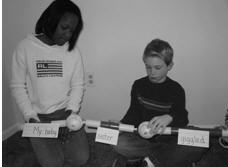 How did this activity help you learn about yourself and perseverance? Once students understand complete subject, complete predicate, simple subject and simple predicate, have students write their own subjects and predicates on sentence strips for further practice of this topic. Remind students to keep their phrases simple, and prepare for a lot giggles during this activity as things can get quite silly! 2. Additional parts of speech. Look for another activity covering additional parts of speech (such as direct objects, prepositions and more) in the next volume!